For the sign located on a controlled-access highway, see Exit number. The red or green EXIT sign is more common in the US. An exit sign is a device in a public facility (such as a building, aircraft, or boat) denoting the location of the closest emergency exit in case of fire or other emergency. Most relevant codes (fire, building, health, or safety) require exit signs to be permanently lit. Exit signs are designed to be absolutely unmistakable and understandable to anyone. In the past, this generally meant exit signs that show the word "EXIT" or the equivalent in the local language, but increasingly exit signs around the world are in pictogram form, with or without supplementary text. Early exit signs were generally either made of metal and lit by a nearby incandescent light bulb or were a white glass cover with "EXIT" written in red, placed directly in front of a single-bulb light fixture. An inherent flaw with these designs was that in a fire, the power to the light often failed. In addition, the fixtures could be difficult to see in a fire where smoke often reduced visibility, despite being relatively bright. The biggest problem was that the exit sign was hardly distinguishable from an ordinary safety lighting fixture commonly installed above doors in the past. The problem was partially solved by using red-tinted globes instead. Better signs were soon developed that more resembled today's modern exit sign, with an incandescent bulb inside a rectangular-shaped box that backlit the word "EXIT" on one or both sides. Being larger than its predecessors, this version of the exit sign solved some of the visibility problems. The sign was only useful as long as mains power remained on. As battery-backup systems became smaller and more efficient, some exit signs began to use a dual-power system. Under normal conditions, the exit sign was lit by mains power and the battery was in a charged state. In the event of a power outage, the battery would supply power to light the sign. Early battery-backup systems were big, heavy, and costly. Modern systems are lightweight, can be installed virtually anywhere, and are integrated into the fixture, rather than requiring a separate box. As batteries improved, so did the amount of time that a fixture could remain lit on batteries. While exit signs were more visible due to large letters, even a 60-watt incandescent bulb shining through a plastic or glass cover could appear somewhat dim under certain conditions. Incandescent bulbs are still in use because they are cheap and common, even though they use more electricity and require more or less frequent replacement. Incandescent bulbs lit 24/7 have a greatly extended lifespan compared to ones that cycle on and off. When used in exit signs, they are often operated at a lower voltage than rated, which further extends their lifetime, at the tradeoff of reduced light output and greatly reduced energy efficiency. With the development of fluorescent lamp and light-emitting diode technology, exit signs could be made even brighter to compensate for the limited visibility in a fire situation, while using less electricity. Fluorescent lamps work in the same way as incandescent bulbs, back-lighting both sides of an exit fixture from within. LED signs combine a large number of bright light-emitting diodes to illuminate the sign from inside. An exit sign is constantly lit; fluorescent bulbs need to be changed more often than LEDs, although the absence of frequent on/off cycles extends the life of fluorescent lamps significantly. Generally, LEDs have a very long life, and may last for 10 years or more of continuous use, although their brightness may gradually diminish. Radioluminescent and phosphorescent signs that require no electricity have also been developed, and have been used since the 1970s. Radioluminescence uses the radioactive decay of tritium gas to illuminate the sign, while phosphorescence uses light-emitting phosphors to glow in the dark. While both of these signs meet California State Fire Marshal standards, electricity is used in the vast majority of signs. Most exit signs in the world, except in countries such as the US, Australia, Hong Kong, Philippines, and Singapore, are of pictogram type. Australia, Singapore, and Hong Kong have made changes to their respective life safety codes to encourage pictogram use. In the US, regulations require text based exit signs for all standard mounted applications. However, globalization has led to limited adoption of the ISO pictogram in the US. For example, the NFPA has approved the ISO pictogram as an option for low level glow-in-the-dark signs. New York City local law 26 requires these low level symbolic signs in all high rise buildings. In tunnels, the Transportation Research Board recommends using the ISO symbol. Newer Airbus, Bombardier CS100 and Boeing 787 Dreamliner planes started using the new pictogram exit signs, which were approved by the FAA in 2012 and 2014 (depending on aircraft type). Modern exit signs often can be seen indicating the path to an exit in commercial and large residential buildings that comply with fire code. Certain circumstances, such as the year a building was built, may leave it exempt from some of these codes. In most situations, the owner of the building is responsible for complying with exit sign requirements. This is especially true in older buildings that serve as multiple residences, such as apartment buildings, hotels, and campus dormitories. Modern signs can also adopt active and/or dissuasive signage solutions . Modern fixtures are usually in a rugged plastic or metal housing securely bolted to the wall or ceiling. The signs have the word "EXIT", or a picture representing exit, on both sides. Single-sided signs are also available for wall-mount installations. The signs often have metal or plastic knock-outs which can be removed so that an arrow is also lit pointing left or right. Modern exit signs are often combined with other safety devices, such as emergency floodlighting for supplementary area illumination . Exit signs draw a relatively small amount of power, and can generally be added onto any existing electrical circuit without adverse effects. Modern exit signs are also, to some degree, flame retardant. In addition, specialized LED lamps with "candelabra" sized screw-in bases are available to replace the always-on incandescent lamps in older exit signs. This allows the existing fixtures to be easily upgraded to save energy, without the expense of complete replacement. Most recently, LEC (light emitting capacitor) exit signs have come to market. Also called electroluminescent (EL), these signs only consume 1/4W of power, and have an operational life of 30+ years which far exceeds the typical 10-year life of an LED sign. It is a serious offense as a building owner or landlord to not comply with the fire/building code in terms of Exit signage. In July 2016, for example, a fire in a Toronto apartment caused the death of one person and injured many others.An investigation found that Emergency and Exit lights were not properly illuminated, and the landlord was fined about $20,000 for "not properly illuminating exit signs, and having no record of emergency lighting tests", and another $50,000 for other infractions to the code. Radioluminescence (or "self-luminous") where a phosphor coating inside a glass tube glows due to the beta decay of radioactive tritium gas sealed into the tube. Radioluminescent exit signs are prohibited in US Department of Defense installations. In most regions, including the European Union, Japan, South Korea, and China, exit signs have green lettering. (In this color scheme, red is reserved to indicate prohibited activities.) In Australia, New Zealand and most European countries pictograms are used in place of the word "exit". European sign directive 92/58/EEC of 24 June 1992 indicates that the signs should be green in color to indicate a safe place of exit. BS EN 1838:1999, BS 5266-7:1999 also governs the emergency lighting applications. 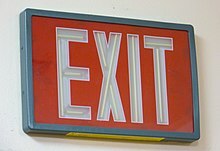 In the US, exit signs can have either red or green lettering, but traditionally have been red. Many states or cities have enacted building codes which specify the sign color. For example, in Baltimore, Salt Lake City, and Portland, Oregon, green is required. New York City, Rhode Island, and Chicago (along with the rest of Illinois) require that exit signs have red text. 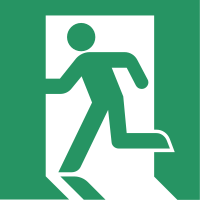 New and renovated buildings in Canada are required to use the international standard green "running man" pictogram. The 1995 Canadian national building code required "red letters on a contrasting background or white letters on a red background ... spelling EXIT or SORTIE", however the 2010 Code calls for a switch from the red EXIT signs to the green "running-man" signs. The national building code informs provincial and municipal building codes but does not have legal status itself. Most Canadian jurisdictions require the international green "running-man" pictogram, however some have allowed red "EXIT" signs to be maintained in older properties so long as one style is used consistently throughout the building. Green fluorescent signs can be seen better in dark conditions than other colors, as the human rod cell is more sensitive to these wavelengths. Newly installed exit signs in Australia are green with white "running man" figure (AS2293). There is a trend towards providing a more accessible, socially inclusive exit sign design based on universal design principles, including consideration for people with disability in an overall exit sign strategy for a building or facility. The Accessible Exit Sign Project started in Australia in 2014, has spread to New Zealand and the United States, and is an international awareness campaign that promotes the need for an accessible means of egress. Advocates proposes that appropriate exit signage to identify the accessible means of egress is a critical component to the successful emergency planning for any building. The proposed new exit sign design features an "Accessible Means of Egress Icon", which includes an adaptation of the "running man" symbol with a new wheelchair symbol. The design is considered an enhanced version of the ISO 7010 and ISO 21542 accessible exit sign that shows the "running man" and International Symbol of Access at the end of the sign. The universally inclusive design with the "running man" and 'Accessible Means of Egress Icon' wheelchair symbol essentially share the same upper torso, and the design shows the two moving through the door together. The Global Alliance on Accessible Technologies and Environments (GAATES) has stated that the introduction of the "Accessible Means of Egress Icon" onto exit signage changes the current discriminatory approach to emergency exit signs and presents a fully inclusive design. "The combined ‘Running Man’ and ‘Accessible Means of Egress Icon’ shown above are working together to escape the building. They move in unison, display the same urgency and motion and appear to be travelling at the same speed. Their heads are forward, showing their haste. Arms are extended and motioning back and forth as they move through the doorway." The accessible exit signs are now being produced in Australia, New Zealand, United States and United Kingdom, also featuring braille and tactile lettering suitable for people that have low vision or are blind. The design is intended to show where wheelchair accessible exit routes, evacuation lifts, evacuation devices and areas of refuge are located. The concept also provides more intuitive building design to assist people that are blind or have low vision to locate an exit. The design also meets the intent of the UN Convention on the Rights of Persons with Disabilities which requires signatory countries to consider the need for universal design in buildings. ^ Jin, Tadahisa (December 2007). "誘導灯表示面のピクトグラフについて". Kasai. Japan Association for Fire Science and Engineering. 57 (6): 38. ^ The English word "exit" comes directly from the Latin word meaning "(he or she) goes out. ^ Turner, Julia (2010-03-09). "The Big Red Word vs. the Little Green Man: The international war over exit signs". Slate. ^ a b "Exit Signs". exitsignwarehouse.com. ^ "NRC: Backgrounder on Tritium EXIT Signs". nrc.gov. ^ NFPA 170 Standard for Fire Safety and Emergency Symbols. National Fire Protection Association. 2018. pp. 170–8. ^ "New York City Building Code Reference Standard RS 6-1 Photoluminescent Low-Level Exit Path Markings - Other News - News | American Society of Safety Engineers". www.asse.org. Retrieved 2018-03-13. ^ "Identification and Comprehension of Symbolic Exit Signs for Small Transport-Category Airplanes" (PDF). FAA.gov. US Federal Aviation Administration. February 2012. Retrieved Mar 13, 2018. ^ Olander J.; Ronchi E.; Lovreglio R.; Nilsson D. (2017). "Dissuasive exit signage for building fire evacuation". Applied Ergonomics. 59: 84–93. doi:10.1016/j.apergo.2016.08.029. ^ "LED Blade Exit Light With Spotfire". ^ "Emergency Lighting / EXIT Signage Testing Requirements". Brighton Town Hall. Retrieved 15 October 2014. ^ "What is Emergency Lighting?". WBS Technology. ^ "Lighting Reference Guide – Exit Signs". National Resources Canada. Archived from the original on July 17, 2012. ^ Carss, Barbara (October 2010). "Traditional Signs to EXIT in Favour of the Running Man". Canadian Property Management. Archived from the original on 2013-02-28. Retrieved 2015-07-06. ^ "Policy on Exit Sign Installations in Existing Buildings" (PDF). June 2011. Retrieved 2015-07-06. ^ Stryer, L (2002). Biochemistry. New York: W H Freeman. pp. 32.3.1. ^ Bowmaker, J K; Dartnell (1980). "Visual pigments of rods and cones in a human retina". Journal of Physiology. 298: 501–511. doi:10.1113/jphysiol.1980.sp013097. PMC 1279132. PMID 7359434. ^ "Why are accessible exit signs important?". Accessible Exit Sign Project. Retrieved 14 March 2015. ^ a b "The Accessible Exit Sign Project". GAATES Global Accessibility News. Retrieved 14 March 2015. ^ "Accessible Signs in New Zealand" (PDF). The Professional Engineer (85): 3. February 2015. Retrieved 14 March 2015. ^ Miller, Mark. "Accessible Exit Signs". Interactive Accessibility. Retrieved 14 March 2015. ^ Wilson, Lee (March 2015). "Planning for Evacuating People with Disability". International Fire Protection Magazine (61): 48–50. Retrieved 14 March 2015.